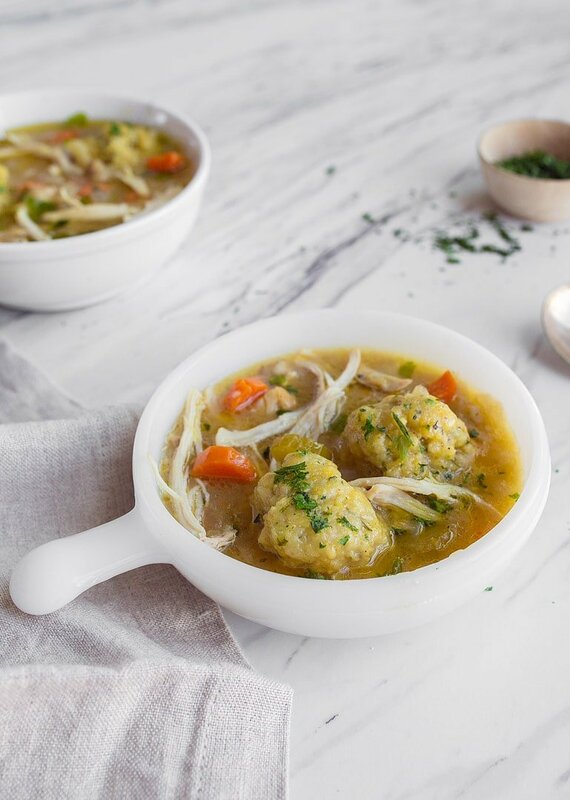 Instant Pot Chicken and Dumplings for two, made in the Instant Pot mini! You’ve never met a bigger fan of dumplings than me. And the thing is, I didn’t even grow up on them. I grew up on great chicken soup, but dumplings I was denied. This is probably why I love them so much now. Being a noodle lover, I ventured into the dumpling world in college, probably after watching them being made on the Food Network. (My cooking ventures began in college when I routinely skipped class to watch cooking shows). As you might expect, I’m opinionated about dumplings. I don’t like them dry on the inside, I like them all the way wet. I like them fluffy and flecked with fresh finely chopped parsley. Oh, and I like them in less time than it normally takes to make them. Enter my quick version made in the Instant Pot. These Instant Pot Chicken and Dumplings for Two might be the thing I’ve made the most in my Instant Pot mini. I buy big packs of local chicken thighs, and freeze them two to a bag using my FoodSaver system. It’s so easy for me to pull a small bag out in the morning to defrost by dinner time. Also, I use my small batch Instant Pot Chicken Stock, but if you want to use store-bought, it’s totally fine! 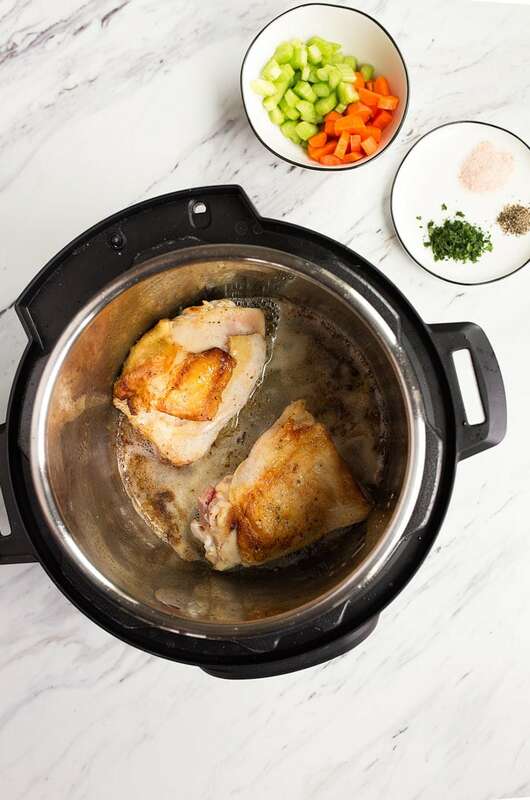 While most Instant Pot chicken recipes are dump, close and set, this one has an extra step. I’m going to ask you to sear the chicken using the sauté setting, is that ok? Pinky promise it’s worth it. Because then, we’re going to sauté the vegetables in the chicken fat, and anything sautéed in chicken fat is better than anything not sautéed in chicken fat. 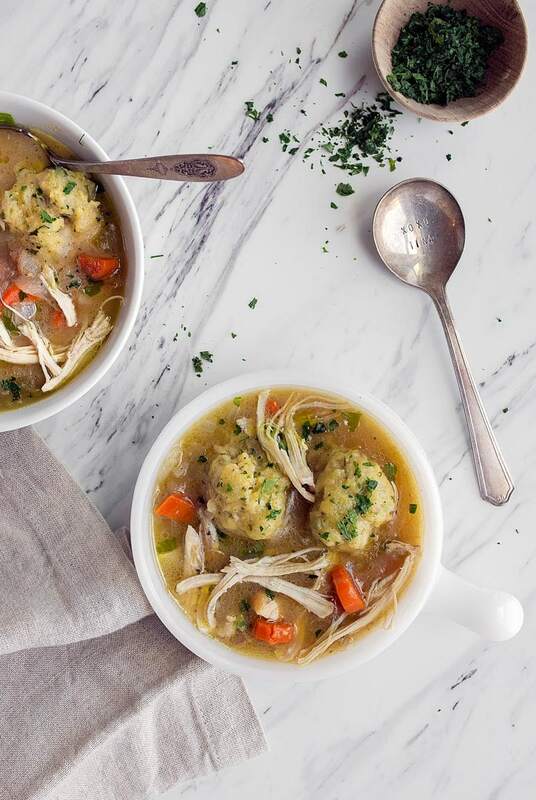 We’re using bone-in, skin-on chicken thighs for this Instant Pot Chicken and Dumplings for two recipe because it makes a deep, rich broth. Please tell me if any of you guys make it with boneless skinless chicken, though! 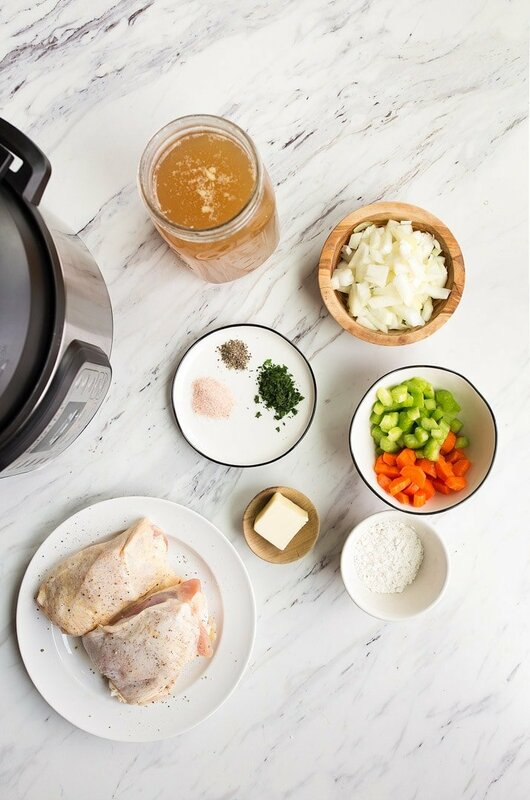 I adapted this recipe from Melissa Clark’s version, and I have to say that when you’re converting a recipe for the big Instant Pot for the Instant Pot Mini, it’s not just a matter of scaling down the ingredients. The cooking time usually needs to be reduced by a ton. The first time I made her recipe, I followed the cooking times and had mushy chicken and tough dumplings. It was not good. But, I tweaked it a bit in subsequent testing and found the perfect ratios and times for the Instant Pot mini. This Instant Pot Chicken Dumplings for Two recipe is perfect now. I hope you try it! 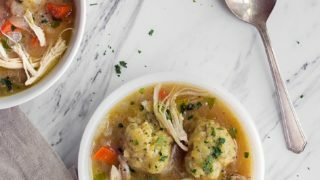 Instant Pot Mini Chicken and Dumplings for Two. Remove the lid from the Instant Pot mini 3 quart, and turn it to the SAUTE setting. Add the butter to the pot, and let it melt until it starts to sizzle. Add the chicken thighs (skin side down) to the pan, and sear until golden brown (about 4-5 minutes). Flip and sear the other side, too. Remove the chicken from the pot, and place on a plate. Add the flour to the pot, and stir to make a paste. Add the carrot, celery, onion, salt, pepper, and parsley. Cook while stirring occasionally for 2 minutes. Add the chicken stock and chicken back to the pot. Cancel the SAUTE setting, and press the PRESSURE COOK' button. Set the timer for 8 minutes. Close the lid on the instant pot, and turn the steam valve to SEAL. It will start timing once the pot reaches pressure (in about 10-15 minutes). When the time is up, do a natural pressure release. Do not open the pot until the valve drops. Remove the chicken from the pot and let cool on a plate. Meanwhile, make the dumplings by whisking together the flour, cornmeal, baking powder, parsley, salt and pepper. In a separate bowl, whisk together the melted butter and milk. Whisk the dry and wet ingredients together for the dumplings. Don't over-mix your dough or your dumplings will be tough. Plop large tablespoon-sized chunks of dumplings into the Instant Pot broth (remember the chicken is not in the pot right now). Place the lid back on the pot, hit PRESSURE and add 2 minutes. (They will cook longer than 2 minutes because of the time it takes for the pot to come up to pressure). After the 2 minutes is up, do a forced pressure release (again, use an oven mitt and be careful of the steam). Shred the chicken and divide it between two bowls. Ladle the dumplings and broth into each bowl and serve. OMG! I love the idea of dumplings for two!! definitely will be making these dumplings this weeks for dinner. I alreayd have a freezer full of chicken soup, so it’ll be a great add on! Now question, if one is making your chicken stock, what happens to the chicken the stock was made with? I’m assuming it’s been boiled into oblivion and is not the best for eating? Or is it totally delicious and shreddable to be used in something like this recipe? Second question, still a poor college student rocking out with a 2q slow cooker and no instant pot over here, could this be made in a slow cooker or would I be better to do it on the stove top? Hi Elizabeth! So, I actually shred the chicken and let my toddler eat it. She’s funny about meat and super soft chicken is something she will totally eat! I’ve found that it’s not ruined the way it would be if you simmered it all day. You can totally make it in the slow cooker! Add the dumplings at the very end, cover and cook 10 minutes? Test a dumpling before serving :) Good luck! My nutrition calculator is acting up. The calories are for the entire pot, as if it were 1 serving, so sorry! Making this tonight for dinner and unfortunately when I released the pressure after the first 10 minutes there was liquid shooting out all over the place, instead of just steam! Currently have the dumplings in now on low pressure. Any idea what I did wrong? Was I supposed to do the initial cook on low or high pressure? Love your cookbooks and instagram feed!! Thank you for your quick reply!! Just wanted to say we finished the recipe and it still turned out absolutely delicious! I will definitely make this again, just leave myself a little extra time for the natural release! I made this in my 6qt lux. Used a bit more chicken (boneless thighs), but didn’t change the times. It fed all thre of us. It was great! Amazing info, thank you! :) So glad you liked it! I just ordered my mini and I’m so excited. It doesn’t seem there are a ton of mini recipes out there like there are for the full sizes so I look forward to more of your testing! It’s just my 20 month old and me, so I’m thinking it will be perfect. This worked great for us. Looking forward to more IP 3 quart recipes. Thank you. Hi Christina! I just bought my Instant Pot and want to use this as my inaugural recipe! If I double the recipe (my boys LOVE leftovers), would I increase the cook time at all? (I did buy the 6 qt pot.) Thank you! I would like to make your chicken and dumplings. I have a 4 qt.instanta pot. Do I have to make any adjustments in cooking ? Christina! I commented earlier about doubling the recipe. Well, I did tonight in the 6qt, but still using the same timing. This was so, so good! The only hard part was pulling the chicken out because it was so tender, it was falling off the bone! Thanks for this! I love the serving plates – where are they from? The little bowls with handles? I’m so sorry, but they’re vintage. They’re called milk glass. Can’t wait to try this recipe when it gets cooler :) Thank you for sharing!! I used the InstaPot Nova Plus. I also cooked more chicken, and added more pepper than suggested. This was delicious. Thank you. I’m still trying to get get comfortable with this machine. Side note: I felt like a Witch making something in her cauldron. Don’t know why but that’s what came to mind. But a good witch. I’d say about an hour start to finish, Ashleigh. The longer it simmers the better, though! Pressure release- do you mean to wear an oven mitt and slowly release? I didn’t see updated info in the recipe about this. Yep, cover your hand to protect it, and then open the valve. Be very careful because the steam is HOT. I am so very grateful that you are publishing recipes for the three-quart Instant Pot. I have one, having traded in the bigger one because after all there are only two of usually! I too have had trouble adjusting the times in the recipes for the six-quart Instant Pot. You should do al whole cookbook on this! Seriously-nobody else seems to have noticed the difference, or that there are many people who use the smaller version!